At her divorce party, Kimberly Santleben-Stiteler sent her wedding dress up in flames. Kimberly Santleben-Stiteler kicked off her newly single life with a bang on Saturday. The 43-year-old destroyed her wedding dress in an explosion at a party to celebrate her divorce being finalized a day earlier. Santleben-Stiteler originally planned to just burn the dress, which she told the Fort Worth Star-Telegram "represented a lie," but her family thought of a bigger way to get rid of the symbol of her 14-year marriage. 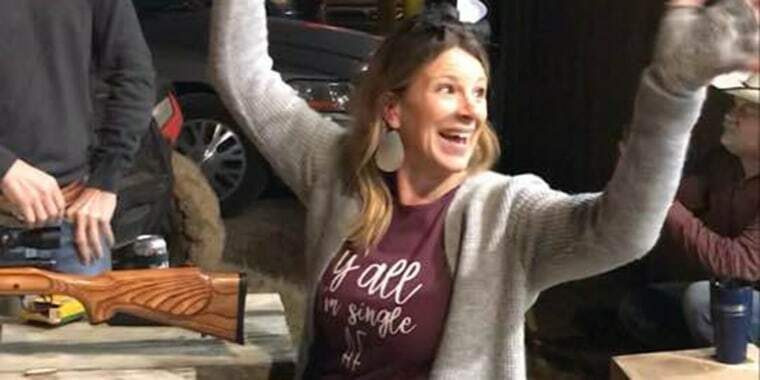 A video posted to Facebook by her sister, Carla Santleben-Newport, shows the Texas teacher shooting at her wedding dress, which had been rigged with 20 pounds of an explosive called tannerite, at her father's farm in LaCoste, Texas. With around 40 people looking on, Santleben-Stiteler hits it on her first try, sending the dress up in flames. "We have a friend who is a bomb tech and he kept saying, 'That's really a lot,' like five different times when we told him our plan," Santleben-Newport said of the amount of tannerite used. "My dad and husband set the dress up at 100 yards from the barn on our family farm. Everyone was worried it was too close so they moved it out another 100 yards." Santleben-Newport said the family received messages from friends roughly 15 miles away who had felt the jolt from what she dubbed "the shot heard around Medina County." "People were messaging us on Facebook and texting us saying, 'Holy cow, was that just y’all?' They couldn’t believe that they heard it," she said. At the end of the day, Santleben-Newport said the so-called "divorce party" was more about family than her sister's ex. "It wasn’t done for him or about him," she said. "It was just our family having a fun-filled celebration."